New York is full of parks. In a city like New York where one can find thousands of things to complain about, the scarcity of parks is not one of them. Big or small, there are at least one or two parks that every New Yorker can claim as a getaway. On a fine day, there is nothing more relaxing than a little bit of law-breaking and sipping your bubbly wine with your sushi at a park. What is also fascinating about New York parks besides their tempting natures for public drinking is that these park are the homes of many impressive site-specific art works. Sometimes ignored by the fast-passing New Yorkers that are too busy to care, these art works usually serve as the proof of the difference between looking and seeing. The eyes that actually see catch these artworks to experience a quick break from the common park atmosphere. The intriguing aspect of site-specific works in public spaces lies at that quick but intense communication between the onlooker and the work. Different from a regular white cube gallery visit, connecting with a surprising artwork at a public space is a unique experience for an art lover in terms of the unexpectedness of the connection. Public Art Fund’s exhibition titled Lightness of Being doesn’t fall behind a major Chelsea show. It brings together big names of the art world with some emerging names. Sculptures by artists such as Franz West, Alicja Kwade and Ugo Rondinone make extraordinary statements about sculpture-making by using more eccentric and whimsical subject matters than what we are used to seeing in sculpture. The innovative and witty natures of these sculptures make a nice contrast with all those heavy-looking government buildings in the area. Olaf Breuning’s Humans is a series of seven sculptures that are installed to make a circle on the south side of the park. These part animal part human figurines all stand out as the replicas of some kind of obscurity between being a human or an animal, and makes viewers question what they are first; humanly animals or animalistic humans. With their round and bulky structures, these figures represent human evolution as a back and forth, rather than progress. A mouse with a human face is next to a primitive-looking woman with wooden sticks in her hands and on her head. While one of the sculptures stand out as a fish, another one portrays a king that has not one, but ten crowns. The king that is carrying the burden of not one but ten crowns has a sad face just like all the other five sculptures in this series. 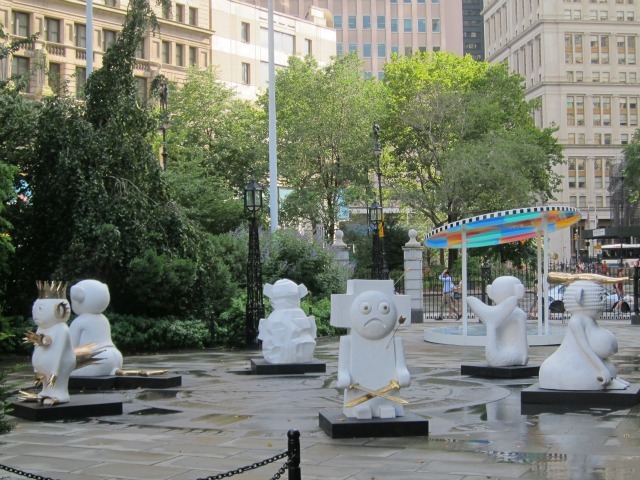 Breuning’s takes an unorthodox and ingenious look on human condition through these six oddly charming sculptures that are giving sad, sad faces to the visitors of City Hall Park. Four stops up on the 6 train from City Hall Park takes you to Tompkins Square Park. Hidden behind the fence across the west side entrance of the park stands Serendipity, Fanny Allié’s steel sculpture of a homeless man’s silhouette. Different from most of the public art works, I had to really search for it. In this square shaped park, finding a life size steel silhouette sculpture can be harder than you think; so much that I had to text the artist of the work, Fanny, who I also happen to know in person. With her guidance on the phone, I was able to reach to this lonely steel guy. Putting Fanny’s work previously in one of the exhibitions I curated, I know her subject matters mostly include the ambiguity between the familiar and the foreign, and the use of unlikely materials to transfer certain emotions. For this sculpture she uses steel, and it looks like it was a smart idea: when I went to see it, the sculpture was ‘re-arranged’ by local park visitors with a hat, a tie, a soda can and a condom (not used as far as I could see). Public artworks are always under the risk of being damaged as they are exposed to public’s outreach, and a sculpture made with another less durable might not last till November as it is planned to. Tompkins Square Park is a home to a considerably large number of homeless people, so much that when the park is googled, this fact appears as one of the primary aspects related to the park. 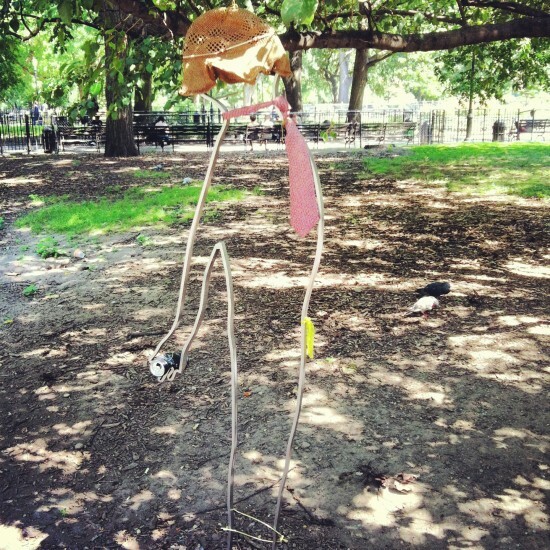 It comes as no surprise that, to grasp the soul of this Alphabet City park, Fanny also created a homeless figure that one can see at the park any given time. As the model for her sculpture, the artist used a real person whom she met at the park during her research; and this person who used to be homeless for many years served as an inspiration for her aside being the actual model for her work. The figure’s face is looking up to the sky, maybe smelling the air or trying to see the sun. His shoulders and arms outreached; preparing to take a flight, as Fanny suggests in her press release. Tags: Fanny Allié, Franz West, New York City, New York City Hall, Olaf Breuning, Public Art Fund, Sculpture, Tompkins Square Park, Ugo Rondinone. Bookmark the permalink.